Branching scleractinians provide fish with critical refuge against predation. While in the Caribbean and Indo-Pacific regions they are conspicuous elements of the reef community, in the tropical Southwestern Atlantic (Brazil) branching corals are lacking and massive forms dominate. The only branching forms that occur in Brazil are stinging fire-corals of genus Millepora (Hydrozoa). Preliminary observations showed that several fish species seek refuge within fire-corals in Brazil, suggesting that they may replace the functional role played by scleractinians in other regions. Here, the association of fishes to individual fire-coral colonies (Millepora alcicornis and M. brasiliensis) and the relationship between fire-coral cover and fish abundance was studied in eastern Brazil. A total of 38 fish species from 18 families (37 % of the regional species pool) were recorded within fire-corals. Most records were of relatively small-bodied fishes and juveniles of large-bodied fishes. Comparative observations between day and night indicated that fire-corals are used as sleeping sites by a few species. 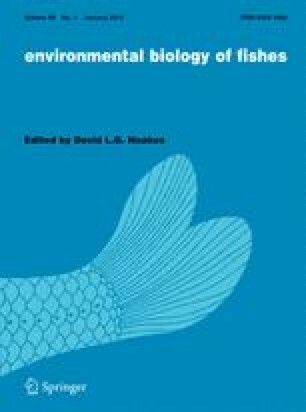 Volume of colonies was positively correlated with fish abundance and species richness. Over a large spatial scale (tens of kilometers) fire-coral cover had a positive and significant influence on the abundance of three fish species only (Abudefduf saxatilis, Acanthurus coeruleus and Microspatodon chrysurus). Although physical attributes of colonies and fire-coral cover may help to account for some of the spatial variability in fish abundance, fire-corals may be considered as an alternative instead of a critical microhabitat for fish. The advantages and drawbacks of living in a branching and stinging environment are discussed. We thank G. Fiuza-Lima, D. Lima Araújo, C. Marques, E. Marocci and R.M. Reis for field assistance. Parque Nacional Marinho de Abrolhos and Reserva Extrativista Marinha de Corumbau/ICMBio (through J.R.S. Neto and R. Oliveira, respectively) for logistical support and research permits. We acknowledge the two anonymous referees for their comprehensive review, which greatly improved the manuscript. Financial support was provided by the Conselho Nacional de Desenvolvimento Científico e Tecnológico/Pro-Abrolhos and Conservation International (CI). This is a contribution of the CI’s Marine Management Areas Science Program, Brazil Node.